Feb 2019 | Kurt Hockemeyer and Paul Koch, Ph.D. Collectively known as snow molds, Typhula blight and Microdochium patch are the primary low-temperature diseases of turfgrass around the world (2, 5). Typhula blight (causal agents are Typhula incarnata or T. ishikariensis) requires snow cover in excess of 60 days to develop and was ranked the second most important turfgrass disease in a 1996 GCSAA survey of golf course superintendents from the Great Lakes region (5). Microdochium patch (the causal agent is Microdochium nivale) does not require snow cover to cause disease, though it is most severe under prolonged snow cover and is often observed in the same stand as Typhula blight (6). Control of snow molds has traditionally been obtained with one or two fungicide applications in the fall shortly before snow cover. However, timing of these fungicide applications has been the source of considerable debate among superintendents in recent years. Some superintendents make their applications as close to snow cover as possible, thereby minimizing fungicide degradation before winter. This timing is supported by recent research completed at the University of Wisconsin and funded by the GCSAA that indicates rainfall events and temperatures over 40 F (4.4 C) can rapidly deplete foliar concentrations of both iprodione and chlorothalonil during the winter months (4). However, timing the application so close to snow cover may increase risk for environmental contamination if the fungicides are applied to frozen soils. This timing also increases the chances that an unforeseen snowfall will occur before the fungicides can be applied. More recently, concern has been voiced about the potential for reduced fungicide uptake — and hence reduced protection from disease — of plant-penetrant snow mold fungicides (such as propiconazole) when the turf is not actively growing. Concerned about these issues, other superintendents apply their snow mold fungicides well in advance of the typical onset of snow cover. However, the risk for fungicide degradation before snow cover is significant if rainfall and/or warm temperatures occur, and there is limited research indicating that low temperatures and low plant activity impact fungicide uptake. Despite the importance and lack of clarity surrounding the application timing and uptake of snow mold fungicide, relatively little research has been published on the topic. Research published in 2013 (1) did not see a significant increase in Typhula blight control when a second fungicide application was made one month before snow cover. On the other hand, more recent research (3) found an 80% reduction in Typhula blight (relative to the non-treated control) when only an “early” application was made one month before snow cover. Neither of these studies directly investigated fungicide timing and uptake, however, and the lack of recent research on both issues and the importance of those issues to a large number of superintendents make them prime candidates for further research. The objectives of this project were to determine the rate and degree of propiconazole uptake into turfgrass leaves at 72 F, 57 F, 50 F and 34 F (22.2 C, 13.8 C, 10 C and 1.1 C), and to determine the most appropriate application timing for effective snow mold control at various field sites throughout Wisconsin. Plant uptake of propiconazole was measured on Penncross creeping bentgrass established in an artificial growth medium in growth chambers on the University of Wisconsin campus. A single seed was planted in each container and maintained at a 2-inch (5-cm) cutting height under optimal growth conditions (14-hour photoperiod, 70 F [21.1 C] temperature, 55 F [12.7 C] nighttime temperature) for eight weeks until the plants matured. The plants were then moved to four growth chambers representing different temperatures and day lengths throughout the fall: 72 F with a 12-hour photoperiod, 57 F with an 11-hour photoperiod, 50 F with a 10-hour photoperiod, and 34 F with a nine-hour photoperiod. Two weeks following placement in each growth chamber, plants received 1 milliliter of propiconazole (Banner Maxx, Syngenta) applied in deionized water at a concentration of 1,624 micrograms of propiconazole per milliliter of water. This concentration is roughly equal to that of 2.0 fluid ounces of Banner Maxx diluted in 1.5 gallons of water/1,000 square feet. The propiconazole was applied directly to the soil at the base of the plant using a pipette, and individual plants were measured 24, 48 and 96 hours after the application. At each time point, the plants were cut into three different sections (0-0.44 inch [0-1 cm], 0.44-0.78 inch [1-2 cm], and 0.78-1.18 inches [2-3 cm] above the soil surface) and frozen until propiconazole analysis could take place. Significant variability was observed between replicates and runs of the propiconazole uptake study, which made results difficult to interpret (Table 1). However, it was clear that much less propiconazole was detected in the 0.44- to 0.78-inch and 0.78- to 1.18-inch portions of the leaf blade relative to the 0.44- to 0.78-inch portion. This was evident no matter the temperature and no matter the time after application. In addition, almost no propiconazole was detected in the upper leaf portions (0.44-0.78 inch and 0.78-1.18 inches) in the 34 F growth chamber relative to the other growth chambers. This suggests that upward mobility is limited at colder temperatures, which is not surprising given the transpiration-based movement of propiconazole. However, it remains unlikely that the efficacy of the product is significantly reduced by the lack of fungicide movement in the plant xylem, which occurs when the fungicide is applied to dormant turf. For example, in our research at the University of Wisconsin, we have applied snow mold research trials to completely frozen turf on numerous occasions and observed excellent control with penetrant products under heavy disease pressure. Field trials to determine optimal timing were conducted during the winters of 2015-2016, 2016-2017 and 2017-2018 at three sites throughout Wisconsin that traditionally experience low, moderate and high snow mold pressure. The low-pressure site was the O.J. Noer Turfgrass Research and Education Facility in Madison, Wis.; the moderate-pressure site was Greenwood Hills Country Club in Wausau, Wis. (and, later, Bull’s Eye Country Club in Wisconsin Rapids, Wis.); and the high-pressure site was Timber Ridge Golf Club in Minocqua, Wis. The fungicide timing study at Timber Ridge Golf Club in Minocqua, Wis. The most effective control was achieved when fungicide was applied less than four weeks before snow cover. Seven treatments were carried out at each site: a non-treated control and six different application timings of Instrata (chlorothalonil, fludioxonil, propiconazole; Syngenta) applied at 9.3 fluid ounces/1,000 square feet (2.96 milliliters/square meter). Treatments No. 2 through 6 were targeted for 8, 6, 4, 2 and 0 weeks before traditional snow cover, respectively, and treatment 7 was applied as close to the first significant snowfall of the year as possible. Traditional snow cover timings were established as Nov. 1 for Minocqua, Nov. 15 for Wausau/Wisconsin Rapids, and Dec. 1 for Madison. Dates of actual treatment for each application at the Minocqua site are listed in Table 2. The experimental design was a randomized complete block with four replications and individual plots measuring 3 feet × 10 feet (0.9 meter × 3 meters). A number of environmental variables were measured throughout the fall at each site, including air temperature, relative humidity, dew point, and soil temperature at 2 inches (5 cm) beneath the surface. In addition, heating degree days (HDD) were calculated for each site using a base temperature of 50 F.
Heating degree days work very much like growing degree days, but the accumulation of units occurs when the daily average temperature is below 50 F for the day. For example, on a day when the average of the high and low temperatures is 40 F, the HDD accumulated for that day would be 10. The HDD accumulation for each site began on July 1 of the respective year. Snow mold pressure was high in all three years in Minocqua; unfortunately, it was the only site to experience significant snow mold in any year of the study. The Minocqua results provide a strong indication that there is a sharp cutoff in the efficacy of fungicide timing under heavy disease pressure. Figure 1. Snow mold severity following applications of Instrata at 9.3 fluid ounces/1,000 square feet at various times throughout fall at Timber Ridge Golf Club, Minocqua, Wis. The pre-snow treatment was made on Nov. 16 in 2015, Nov. 17 in 2016 and Nov. 14 in 2017. Figure 2. Accumulation of heating degree days (HDD) for Minocqua, Wis., during 2015, 2016 and 2017. The pre-snow treatment was made on Nov. 16 in 2015, Nov. 17 in 2016 and Nov. 14 in 2017. Figure 3. Soil temperature (at a depth of 2 inches) at the research plot in Minocqua, Wis., during 2015, 2016 and 2017. The pre-snow treatment was made on Nov. 16 in 2015, Nov. 17 in 2016 and Nov. 14 in 2017. Disease was sharply reduced in 2017 and 2018 (and to a lesser extent in 2016) when Instrata was applied four or more weeks before the first significant snowfall (Figure 1). In 2016-2017, control improved dramatically between the Oct. 13 and Oct. 31 applications and an HDD accumulation of 24 (Oct. 13) and 130 (Oct. 31) (Figure 2). In 2017-2018, control improved dramatically between the Oct. 16 and Nov. 1 applications and an HDD of 43 and 176. Using only the Minocqua data, it appears that an HDD of approximately 100 can be used to effectively time applications of Instrata for snow mold control. Soil temperature was not an effective predictor of snow mold fungicide timing because of the large variation experienced from year to year (Figure 3). Additional locations need to be evaluated to determine how applicable this HDD number is for a broader area. We intend to continue this study over more locations to determine whether an HDD-based model can be effective in timing snow mold fungicides. 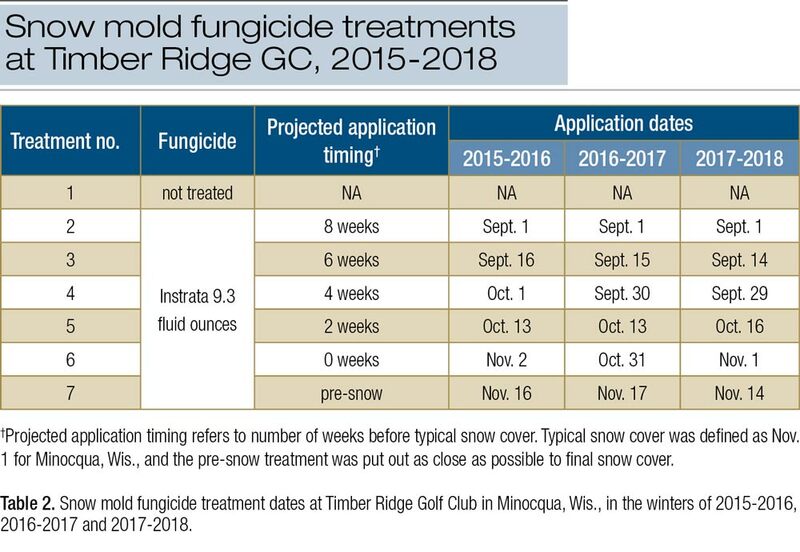 The results of the fungicide timing study clearly demonstrate that timing of fungicide applications targeting snow mold plays a critical role in effective snow mold control. Applying snow mold fungicide applications based solely on the calendar may lead to ineffective snow mold control depending on the environmental conditions present that particular fall. However, during our study, only one site provided enough disease pressure to assess impacts of fungicide timing. Therefore, the applicability of the results to a wider audience remain inconclusive. After we obtain more data over the next two to three years, we will look to test our HDD-based application model at numerous golf courses across Wisconsin and the upper Midwest to determine the model’s efficacy. In addition, other products aside from Instrata will need to be evaluated to determine whether the results obtained from Minocqua in this study apply to other fungicide combinations as well. The results from the propiconazole uptake study were less conclusive, though important information related to propiconazole uptake at colder temperatures is still present in the data set. For instance, the apparent lack of significant mobility above 0.44 inch, no matter the temperature, has important implications for higher-cut turf, and the nearly complete lack of any upward mobility above 0.44 inch at 34 F is important to consider when making snow mold fungicide applications. If we were to conduct the uptake experiment again, we would likely conduct it in a hydroponic system, which would eliminate the variability provided by the growing media and allow more precise measurement of uptake of propiconazole out of the water, into the roots and eventually into the leaves. We greatly appreciate the generosity of the superintendents who hosted trials at their golf courses: Jay Pritzl, Timber Ridge Golf Club in Minocqua, Wis.; Scott Sann, Greenwood Hills Golf Course in Wausau, Wis.; and Tyler Gerrits, Bull’s Eye Country Club in Wisconsin Rapids, Wis. We also thank GCSAA and the Wisconsin GCSA for funding this research. The most effective application timing of fungicides for snow mold control has been debated for some time. This study clearly demonstrated that timing of fungicide applications plays a critical role in effective snow mold control, but more research is needed because only one of the three sites in our three-year study developed snow mold. We intend to continue this study over more locations to determine whether an HDD-based model can be effective in timing snow mold fungicides. The study of uptake of propiconazole was not conclusive, but the lack of uptake beyond 0.44 inch above ground at 34 F is an important consideration when timing snow mold fungicide applications. Hsiang, T., N. Matsumoto and S.M. Millett. 1999. Biology and management of Typhula snow molds of turfgrass. Plant Disease 83:788-798. Mann, R.L., and A.J. Newell. 2005. A survey to determine the incidence and severity of pests and diseases on golf course putting greens in England, Ireland, Scotland, and Wales. International Turfgrass Society Research Journal 10:224-229. Smiley, R.W., P.H. Dernoeden and B.B. Clarke. 2005. Compendium of Turfgrass Diseases. 3rd edition. APS Press, St. Paul, Minn.
Kurt Hockemeyer is Turfgrass Diagnostic Lab manager and Paul Koch is an assistant professor in the Department of Plant Pathology at the University of Wisconsin-Madison.